Debbie is telling Helen about Andrew needing fundraising ideas. 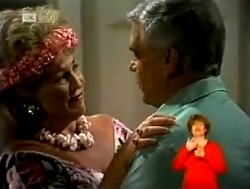 Helen suggests avoiding competitions as they seem to bring out the worst in people, referring to Julie correcting Philip's ballroom dancing in the other room. 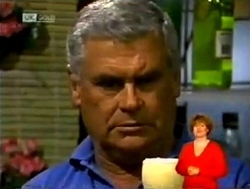 Philip steps on Julie's foot. 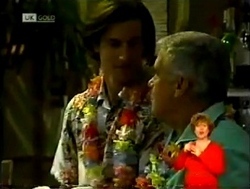 Kev is arranging a potted palm tree for the Hawaiian luau while Gaby tells Cheryl that Rick won't be coming in to work as he's heartbroken over Sally. Kris Hyde comes in with some flowers and Gaby refuses to go out with him before he even has a chance to ask! Mark comes from the kitchen stressing over a missing ham delivery. Cheryl tells Mark it's his responsibility to sort these things out. Gaby tells him all he needs to do is ring Bert to find out where the ham is. Mark says he'll wring his neck! He heads back to the kitchen and Cheryl says Mark is becoming a serious pain! Cody still doesn't understand what Debbie sees in Andrew. Debbie suggests a dance for the centenary and Cody mentions a dance they had in the States where everyone dressed up a hundred years into the future. Debbie has something more classical in mind. She says she will run it by Andrew, which Cody makes fun of. Helen is trying to paint while Julie is wearing Philip out practising their dancing in the other room. Helen suggests Julie is taking it a bit too seriously. 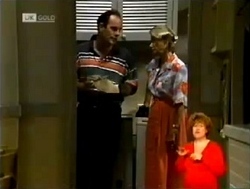 Debbie comes to tell Andrew about her debutante ball idea which Andrew thinks is great. Debbie asks if he likes dancing and invites him to the luau this evening. Mark tells Cheryl that the butcher “Bert the Jerk” has cancelled all dealings with Lassiters and is considering suing Mark for defamation! 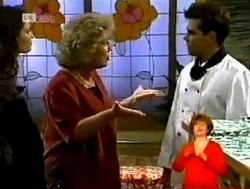 Cheryl tells Mark that she wants ham steak or else! Lou has arrived to lend a hand but tries pulling a beer and it does not go well. Mark is raiding the fridge. ANNALISE: Mark, what are you doing? ANNALISE (sarcastically): Oh hello darling, how are you? MARK: Yeah… I need your ham! Annalise is not sure about some of the ham as it was left out of the fridge. Mark sniffs it and says it smells fine. Annalise hopes he poisons himself! Julie is dancing in the kitchen and says Philip is going to have to do better if they're going to win. Helen asks Julie why she's pushing herself so hard. Julie says she used to cry herself to sleep because she wanted to be a ballerina but no matter how hard she tried she was always bottom of the class. Helen asks if that is a reason to push Philip to the top now. Cody thinks a deb ball is old fashioned and degrading. Debbie reminds her that it's for the centenary so it has to be historical… and Andrew thinks it's a good idea! Cody says she'll have to tell Andrew to get out his tux and tails if he's going to be her date. Cheryl is getting dressed and is stressed about Rick dying of unrequited love, Lou potentially drowning everyone in beer, and Mark letting her down with the ham stakes. She wants the luau to be a hit so she can have regular theme nights. Lou suggests they get this one out of the way first to iron out the bugs (appropriate choice of words, Lou). Helen finds Philip dancing in the laundry room! She says Julie should be grateful she has a partner who is trying so hard but Philip says he's just holding her back; he thinks it would be better if he were to dip out. Cody lets Kris in and comments on the tasteful décor, I.e. Pam's bike. Gaby thinks it is an accident waiting to happen but Cody is looking forward to learning to ride it; pity it's not a Harley. Gaby tells her not to even suggest it. Kris is looking for Rick and Gaby says he's sick. She asks Kris for a lift to the Waterhole. Helen is trying to do Hannah's hair while she bounces around and someone goes mad knocking on the front door. Debbie opens to door to Cody who tells her Mr. Roland likes her deb ball idea. Julie is looking for Philip but Helen says he had some urgent business and will meet her at the Waterhole. Hannah asks Cody if she is coming to the Hawaiian night. CODY: Yea, well I was hoping I wouldn't have to stay at home looking like this! Hannah says Debbie has invited Andrew. Debbie says it's not a date; he just said he might drop by. At the bar, Julie asks Lou if he does cocktails and Lou says he's a pro. Julie, clearly winding him up, orders a double weasel grinder. Lou hasn't got a clue so asks Kev to take care of it. Mark is raiding the store cupboard this time and Annalise asks if he doesn't ever buy his own supplies. He finds the tinned pineapple he's looking for under the counter. Annalise wants to talk about him being such a grouch but he's too busy. Annalise says she will give him a hand as she has finished here. MARK: Yeah, alright, but change your shoes first; you'll slip and break your neck on the tiles in the kitchen if you wear those heels! Lou brings Gaby and Kris a double weasel grinder each; he has just invented it! Cheryl takes a sip and is impressed. Annalise is serving food. 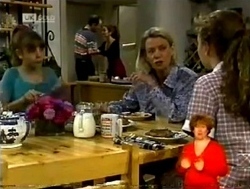 Debbie refuses and Annalise says she is too skinny to be dieting. Cody says Debbie's “certain someone” hasn't shown up yet. Mark appears and tries to drag Annalise back into the kitchen as she's supposed to be helping him. Annalise tells him to find another slave because she quits! 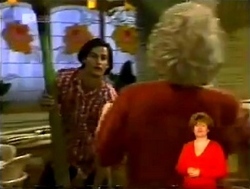 Andrew arrives and finds Cody and Debbie. Philip arrives and tells Julie he has been to see Les Bambridge; he's going to replace him in the competition. Hannah drags him away to join the conga. Annalise has packed Mark's bags as he needs a break; they are going to visit his parents. Mark refuses to go, saying they probably only want money. He found out yesterday that Stephen lent them some money and is going to have to mortgage the shop if he doesn't get it back. Annalise says she is going with or without him. The cab arrives and Annalise leaves. Lou wakes up in the night as the en- suite light is on. Cheryl comes out and says she thinks she has been poisoned.